There is no Legend card at all. I'd call this deck as a Hog rider deck. The Rocket could be used to eliminate a Sparky or Trio musketeers. You can use the arrows in advance As soon as You put the hog rider. 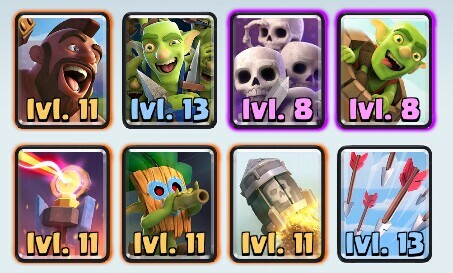 Dart Goblin is specialised in eliminating weak units such as minions. And Be careful If an opponent has a spell then Try not to waste your troop cards .